Unfortunately, cluster analysis is not a default function in Excel. Perhaps this is surprising, given the extent of formulas and calculations on Excel, but it does not run cluster analysis as part of its standard spreadsheet package. 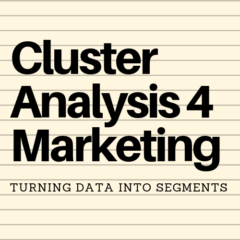 This is why I developed the cluster analysis Excel template for students and practitioners of marketing. While many people have access to Excel, only a few people have direct access to statistical packages that can run cluster analysis (mainly through their university/college or through their workplace). If you only need cluster analysis for a simple assignment or a one-off task or just to better understand how clustering works – then I would recommend that you use the free Excel cluster analysis template available on this website. If you intent to buy/license a commercial cluster analysis statistical package (see possible list below), I would also suggest that you first gain a good understanding of cluster analysis by utilizing the simple spreadsheet template that I developed.